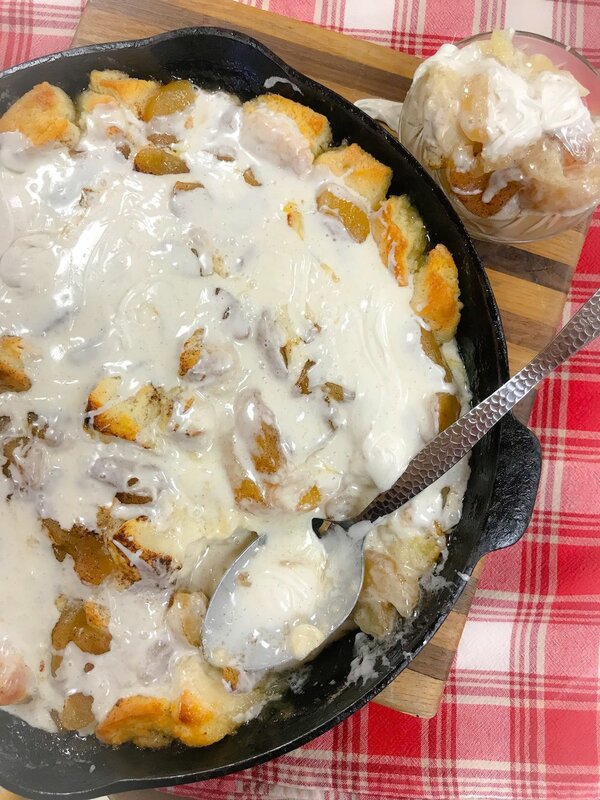 Apple Dumplings — Honey Catering & Co. Allow frozen biscuits to partially thaw. Cut each biscuit into quarters. Spray a 15 inch cast iron skillet or a 4 quart casserole dish with nonstick spray. Place biscuit pieces in dish and cover with apple pie filling. Place butter, water, sugar, and cinnamon in pot and cook until butter is melted and sugar is dissolved. Pour over biscuits and apples. Bake at 350 degrees for 30-45 minutes until biscuit pieces start to brown and are cooked through. While biscuits are cooking make icing. Place powdered sugar, heavy cream, and cinnamon in bowl and mix until smooth. Pour icing over hot biscuits. Serve warm with bourbon vanilla ice cream.